Chrome wheels are a popular way to add luxury to your vehicle. Just because there are a lot of styles out there for chrome rims, that doesn’t mean they are all a great fit for your vehicle. Choosing black chrome wheels is a great way to give your vehicle an understated luxurious look. Bright chrome wheels have their place, but black chrome is both modern and sleek. For a durable and premium rim solution, there’s no better choice than the PVD black chrome wheels offered by Wheel Creations PVD. The physical vapor deposition chrome process we use to create our PVD black chrome wheels utilizes a specialized powder coated primer and vacuum chamber. Once the rims are placed in the chamber, air is pumped out before electrostatically sputtering chrome onto the rims for a smooth and sleek finish. This process is 100% environmentally safe, which makes it popular with vehicle owners of all kinds. With our unique process, we can add black chrome to just about any wheel you want. 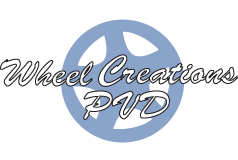 Whether you’re in the market for a new set of OEM wheels or you have aftermarket wheels that need a black chrome finish, Wheel Creations is able to use PVD to provide a lasting finish. Our color options include PVD Black Chrome, PVD Onyx Chrome, and PVD Midnight Chrome. PVD black chrome wheels from Wheel Creations are the ultimate PVD solution for reliable rims that create an impression. This process can be performed on both vintage and OEM wheels. Thanks to our manufacturing process our wheels are also tougher than other chrome plated wheels on the market. They can stand up to moderate curb rash, neglect, and road chemicals that cause traditional plating to peel and corrode. So whether you get our smoked chrome wheels or another variation from our inventory, you’ll be able to enjoy them for a long time.